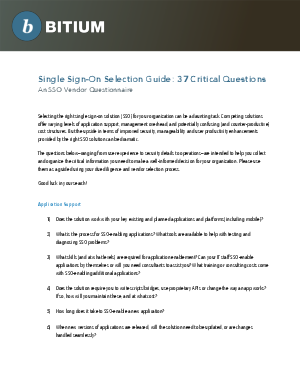 Selecting the right single sign-on solution (SSO) for your organization can be a daunting task. Competing solutions offer varying levels of application support, management overhead, and potentially confusing (and counter- productive) cost structures. But the upside in terms of improved security, manageability and user productivity enhancements provided by the right SSO solution can be dramatic. The questions contained within are intended to help you collect and organize the critical information you need to make a well-informed decision for your organization. Please use them as a guide during your due diligence and vendor selection process. Please download the white paper to learn more.